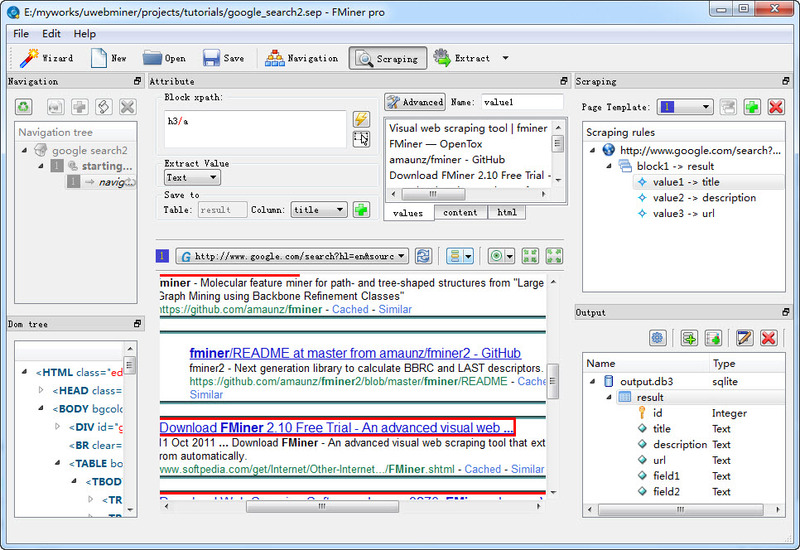 FMiner Pro is an advanced visual web scraping tool that extracts data from web pages automatically. FMiner Pro is a 100% visual tool and allows you to handle web content without using scripts. FMiner Pro can extract not only web data but also the data's relationship(such as FOREIGN KEY) from pages with complicated structures, and save result to database, csv and excel, access, sqlite, mysql, sql server, postgresql. ...... Can extract complete data structures, include data's relation(eg, database foreign keys). Extracted results can be saved to csv, excel(xls), sqlite, access, sql server, mysql, postgres, and can specify the database fields' types and attributes(eg, UNIQUE can avoid duplication of the extracted data); According to the setting, program can build, rebuild or load the database structure, and save the data to an existing database. FMiner Pro edition support incremental extraction, clear extraction and schedule extraction. Qweas is providing links to FMiner Pro 4.00 as a courtesy, and makes no representations regarding FMiner Pro or any other applications or any information related thereto. Any questions, complaints or claims regarding this application FMiner Pro 4.00 must be directed to the appropriate software vendor. You may click the publisher link of FMiner Pro on the top of this page to get more details about the vendor.